Silver-banded Hairstreak (Chlorostrymon simaethis) butterflies range from the southern United States down to Argentina. 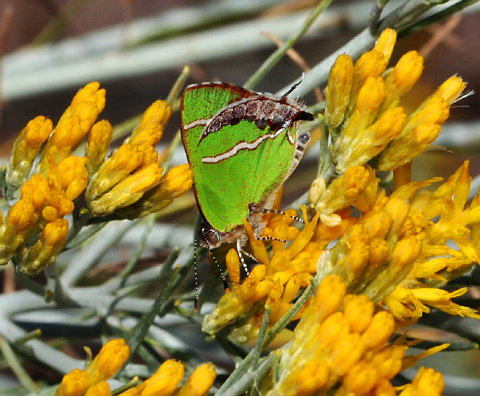 Here in Arizona, these small butterflies are found in the southern and western part of the state. In early November of 2007, I observed this Silver-banded Hairstreak sipping nectar from autumn wildflowers along the San Pedro River in St. David, Arizona. Silver-banded Hairstreaks have emerald green ventral wing surfaces with a distinctive, brown-edged, broad silver band across both the forewings and the hindwings. The ventral hindwings each have a slender "tail" and a crescent of mottled or faintly spotted brown along the far edge of the wing. The similar Juniper Hairstreak (Callophrys gryneus) and Xami Hairstreak (Callophrys xami) lack this crescent of brown on their hindwings, and the silver-white band across their ventral wing surfaces is much narrower and only edged with brown on one side. Although both male and female Silver-banded Hairstreaks have green ventral wing surfaces, their dorsal wing surfaces differ, allowing the sexes to be easily differentiated if their dorsal wing surfaces are visible. The dorsal wing surfaces of the males are dark brown with a wash of violet iridescence, while those of the females are a plain gray-brown. Unfortunately, like many other Hairstreaks (Subfamily Theclinae), Silver-banded Hairstreaks generally feed with their wings closed and flutter their wings rapidly when flying, so catching a glimpse of their dorsal wing surfaces can be challenging, and I have not yet managed to get a photo of them.